Slaughterpit is almost upon us, and, as well as some the filthiest bands we could find, we’ve lined up a chance for you to grab one pair of tickets, plus two t-shirts of your chosen sizes for Hordes Of Belial – Nine Lives! At the event in Church this Saturday (March 31st), we’ll be choosing one ticket buyer at random to take the lot (applies to advance tickets only). So, for £5, one person will see not only Haerken, Uncoffined, Drekavac, and Evil Blood, they’ll also get to take in live performances from Solitary, King Leviathan, Krysthla, Splintered Halo, and 9 other bands in September for free! Better yet, they get a souvenir, and can treat a friend to the same! 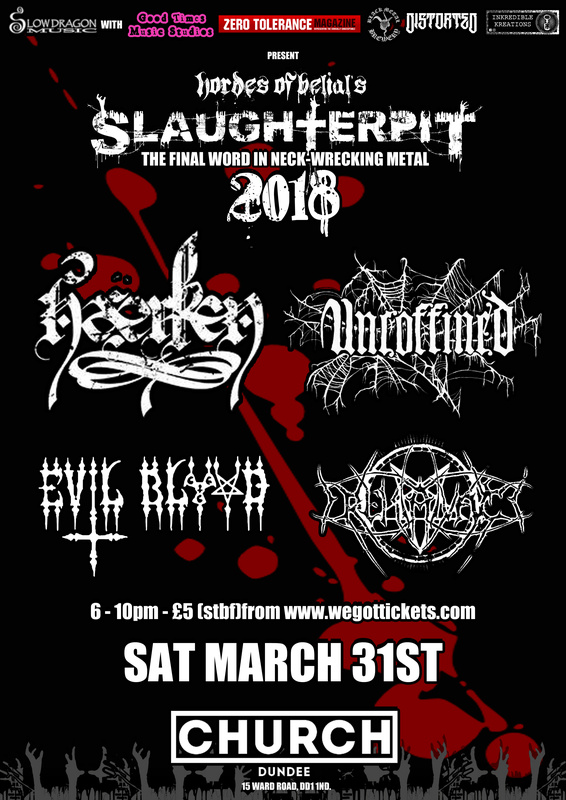 Get your Slaughterpit ticket now, from the link below! Hordes Of Belial’s Slaughterpit is back on the cards for the year! Things are slightly different this time around, however. While still pursuing the aim of only hosting the heaviest and the dirtiest music, the show has been stripped back to a single stage affair, as it was the first time around, back in 2016. It has also moved from its original home of Beat Generator Live, to newer venue Church. Posted in Latest News and tagged Black Metal Brewery, Church Dundee, Competition, Distorted, Drekavac, Evil Blood, Good Times Music Studios, Haerken, Hordes Of Belial, Inkredible Kreations, King Leviathan, Krysthla, Nine Lives, Slaughterpit, Slow Dragon Music, Solitary, Splintered Halo, Uncoffined, Zero Tolerance.